Having your own country cottage to stay in whilst on holiday in the Isle of Wight is a great way to spend a break with your family and friends. With all the amenities you could wish for in our self-catering cottages such as fully-equipped kitchens, private gardens and televisions with DVD players, there is one feature that is most desired – a hot tub. Sinking beneath the steamy waters with soothing massage jets and foamy bubbles, glass of wine in hand after an action-packed day is the perfect ending to a day. As hot tubs are such a luxury, not many people have them at home and so escaping from the daily grind and indulging in pure extravagance while on holiday in the Isle of Wight is something not to miss. We have lots of cottages available with this feature, for you to feel extra pampered on your break. Whether you have been to the Isle of Wight before or if you are thinking about going to this English gem for a holiday sometime in the near future, you may be aware of all of the activities available for travellers, tourists and holidaymakers. With long stretches of golden sand to explore, horse riding, Carisbrooke Castle, adventure parks and the steam railway, you are sure to want to collapse in the comfort of your holiday cottage after a long day of sightseeing. Soaking in a soothing hot tub is the best way to relax your muscles after a long day and some people even say that it will guarantee an undisturbed night’s sleep – great if you are planning on waking up early the next day to do it all again! Even if you are not planning on such a busy holiday, soaking in the hot tub is still a nice option to have. You may opt to book a cottage in the Isle of Wight that does not come with a hot tub, and if this is the case then there are plenty of day spas where you can indulge in this treat for the day as well as having a massage, taking a swim in an indoor pool or having a go on the running machine at the gym. Utopia Spa has many treatments available such as facials, full body massages and hot stone therapy and has a sauna, indoor plunge pool and hot tub. You can also book spa days with them if you want to make your trip to the Isle of Wight all the more special. Have a look at our selection of Isle of Wight cottages with hot tubs, and you may be sinking beneath the bubbles sooner than you think. People like cottages with hot tubs on holiday. We can go from one week to the next without thinking about hot tubs but when faced with the choice or one with compared with one without, most people decide that they would like the one with the hot tub. Perhaps it's the time that we have to relax and do nothing that a holiday allows. 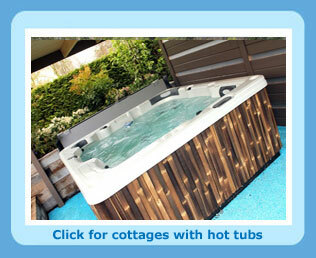 Time spent in a hot tub is a bit of a luxury and why not on holiday? Only certain low foam bubble bath can be used in jacuzzis and hot tubs. Most hot tubs are not emptied between each use; chemicals are used to maintain the quality of the water in a similar fashion to a swimming pool.